When it comes to visiting Phoenix and the rest of the Valley of the Sun, you won't want to miss the exciting cultural events, performances, and shows available at area venues, including the state-of-the-art Mesa Arts Center in downtown Mesa, Arizona. Originally opened in 2005, the Mesa Arts Center incorporate four theaters: the Tom and Janet Ikeda Theater (1,588 seats), the Virginia G. Piper Repertory Theater (550 seats), the Nesbitt/Elliott Playhouse (200 seats), and the Anita Cox Farnsworth Studio Theater (98 seats). There are also five galleries and 14 art studios inside the Mesa Contemporary Arts Museum, which is also housed at the Mesa Art Center grounds, and admission to the galleries is free. 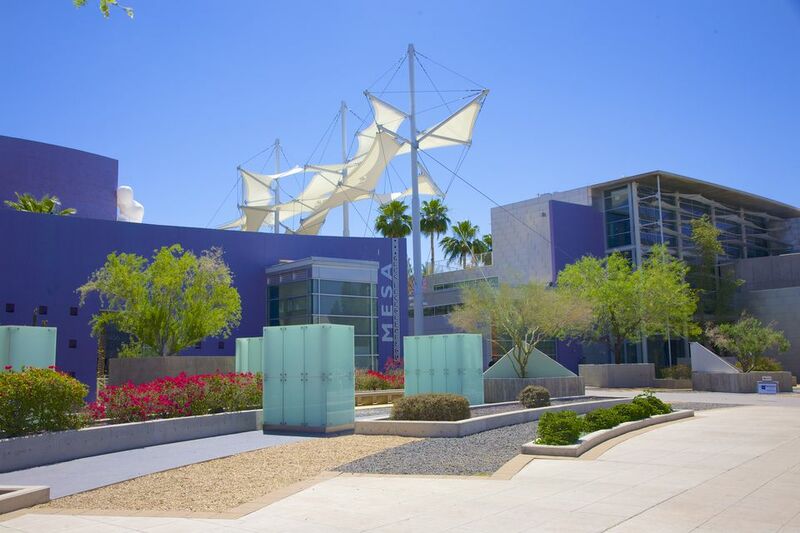 The focus of the Mesa Arts Center is to hosts professional performing arts, visual arts, and arts education programming while the Mesa Contemporary Arts Museum is the visual art exhibition space for the center itself. Located approximately 19 miles east of central Phoenix, Mesa is a thriving community whose residents celebrate both the traditions of the indigenous Hohokam people who first resided in the region and the modern art shows and science exhibits of the city's modern culture. The Mesa Arts Center is located in the heart of downtown Mesa on the southeast corner of Center and Main streets (1 East Main Street). If you can't find parking on the street, use the public parking areas just south of the Mesa Arts Center. From Interstate Highways 17 or 10: Take the Country Club exit on the 202 Loop East and go south (right) to Main Street and make a left. From U.S. Highway 60: Take Country Club exit and turn north (left if arriving from the west; right if arriving from the east) to Main Street; then make a right. From the 101 Loop: Take the 101 Loop to the 202 Loop East; exit at Country Club; go south (right) to Main Street; turn left onto Main. The Mesa Arts Center and Mesa Contemporary Arts Museum are also accessible by Valley Metro Rail. Just take the Light Rail to Mesa at the Main Street/Center Station. Whether you're a resident of the Valley or you're just in town for a quick trip, there are plenty of education and entertainment options available at the Mesa Arts Center, including big-name concerts and special performing arts classes taught by world-renowned artists and performers. For 2018, top-billed performances include David Archuleta, "A Bowie Collection," the United States Army Band and Chorus, Paula Poundstone, Ry Cooder, Rodrigo Y Gabriela, Peter Frampton, and "A Magical Cirque Christmas." You can get tickets to shows at the Mesa Arts Center Box Office (located off Center Street, across the Shadow walk from the theaters), online at the Mesa Arts Center website, or by calling the Box Office and reserving your tickets by phone. You can look ahead to see where you'll be sitting at performances with the seating charts available online. Find your seat at the Mesa Arts Center.